Sharing Pemberton Place® with the Georgia Aquarium in downtown Atlanta, this exciting attraction includes a thrilling, multi-sensory 4-D cinematic adventure, a gallery dedicated to Coke and pop culture, a 7-foot-tall Coca-Cola Polar Bear, a fully functioning bottling line, the Vault of the Secret Formula, and a World of Coca-Cola favorite — the tasting experience — where guests can sample more than 60 different beverages made by The Coca-Cola Company from around the world. Each of the exhibits work together to tell the complete story — past, present and future — of the world's best-known brand. The Loft introduces guests to the rich heritage of Coca-Cola with artifacts from yesterday and today. Coca-Cola Theater features a new short film, "Moments of Happiness," which celebrates life’s everyday moments experienced by people around the world. It features nine mini-stories of people in various life stages and cultures experiencing universal moments of happiness – moments of fun, humor, adventure and love. Vault of the Secret Formula is your up-close look at the vault where the legendary secret formula for Coca-Cola is secured. 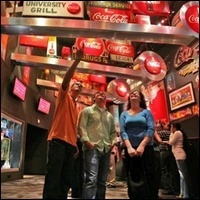 Milestones of Refreshment explores the fascinating story of The Coca-Cola Company in an engaging walk through history. Bottle Works is a behind-the-scenes look at the actual bottling process.